Much'Tal Jedz "When We Speak, We Only Do So Once"
Much'Tal Jedz "Cuando hablamos, lo hacemos una sola vez"
When something begins terrorizing a Mayan village, the people know they must do something to overcome it. Their strategies lead them to a famous archaeologist and eventually, to an unexpected solution. 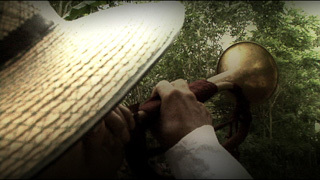 Based on recent and historical events, this film is about the Mayan struggle to maintain their autonomy.